What has research shown about the importance of tactile stimulation in early development? Aseries of studies conducted by Michael Meaney and colleagues has shown how early childhood experiences actually affect the workings of our genes. Through ingenious studies with rats, he showed how maternal care had a potent effect on genes related to the stress response. This process works through chemicals known as epigenetic markers, which land on genes and alter gene expression. In other words they work to turn specific genes off and on. Importantly, they do not alter the DNA sequence but rather the expression of specific genes. The genetic blueprint is not changed, only what parts of the blue print get built. Rats raised by high-lick mothers, who provide more tactile stimulation to their rat pups, were compared to those raised by low-lick mothers. High-lick rat pups had lower levels of the epigenetic markers known as methyl groups than pups raised by low-lick mothers. They also displayed much less stress and tension and were better able to calm themselves. These same epigenetic markers came into play in human beings. The researchers autopsied the brains of people who had died either by suicide or car accident. They found that people with a history of childhood abuse had more epigenetic markers than those without. 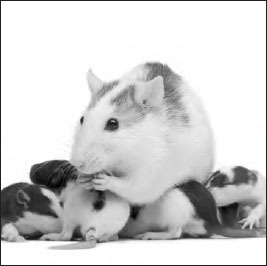 It appears that, in both rats and humans, parental care affects the production of epigenetic markers, which in turn modulates the reactivity to stress. Nurturing early environments reduce reactivity to stress while neglectful or abusive environments heighten the stress response. Rats that are raised by mothers that lick them frequently displayed lower stress levels as adults than rats that were raised with less parental tactile stimulation (iStock).